LAUSANNE, Switzerland – The World Baseball Softball Confederation (WBSC), the world governing body for the sports, announced a landmark agreement that awards Tainan City, Chinese Taipei the hosting rights of the next three editions (2015, 2017, 2019) of the WBSC Under-12 Baseball World Cup, which is the only international baseball tournament in this age group to feature National Teams (along with the U12 World Cup continental qualifiers), and is the only world championship tournament in all of sports at this age level. 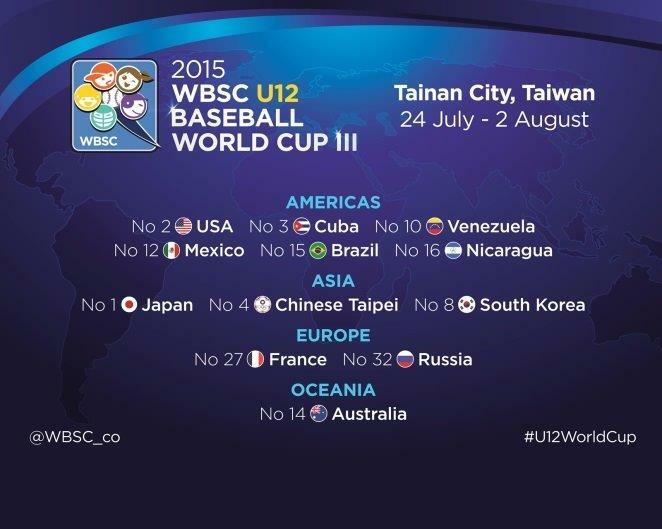 The 2015 U12 Baseball World Cup III, which will showcase the best 12-year-old baseball players in the world, will take place from 24 July to 2 August in Tainan City, with the United States, “Team USA”, entering as the defending U12 World Champions. It will be the first time in U12 baseball history that the top four nations in the world -- Japan, USA, Cuba and Chinese Taipei -- will be represented at the U12 World Cup. The elite competition will also feature ten of the top sixteen ranked nations in the world.